Confirmation bias describes the behaviour where you look for, analyse and remember facts in a way that matches what you already believe. A familiar example is when people believe that Friday the 13th is an unlucky day. They list off dreadful things that have happened to them on that day but manage to ignore or disregard any wonderful events on Friday the 13th! That’s a very day-to-day example, but it happens in projects as well. People pick problems or solutions that fit with how they view the world. Business cases are frequently subject to confirmation bias. You might hear things like “We need to implement this new system immediately to replace the current one as it is always going down” or “We need 3 more people to do analysis as we spend so much time helping other people we can’t get our own work done”. As it is easy enough to find examples of the bad experience we assume that the person making the case has the evidence to back their case, but they may be exhibiting confirmation bias. To overcome confirmation bias you need techniques that support decision making based on real data. One method I find really useful for exploring problem or process issues is the DMAIC Process which is a cornerstone of the Six Sigma approach. Define – Clearly articulate the problem you want to solve and identify the data you need to gather. The focus on measurement and analysis is where the real value comes when trying to reduce confirmation bias. The analysis makes it clear whether somebody is highlighting a problem because they think they see it (confirmation bias) or because it’s a real problem (supported by data). Gathering data is frequently as simple as getting a group of people to keep a tally of how many times they come across a problem in a given time-period. Alternatively, your organisation may have work or problem logging systems that you can analyse. Or you may have to be a bit more inventive! Another area where confirmation bias can creep in is when you are assessing different vendors for a new product or service. Actually, it doesn’t creep in this situation, it tends to storm in with hobnailed boots on! People can only judge something new and unknown against past experiences and those are different for everyone in the team. So, in advance, you agree how to evaluate a vendor, the criteria to use and how important each criterion is. Then you can generate what is called a Weighted Scorecard. As you assess each vendor you score them against each of the agreed criteria. At the end of the process, there is a set of data that you can use to decide which product suits your needs best. You can be confident that key information hasn’t been forgotten or glossed over. Sometimes you get resistance to using these techniques. Some people resist hearing that they are not completely rational and logical. Others see them as unnecessary and time wasting. Disparaging cries of “Let’s not get into analysis paralysis” may be heard from those who just want to DO stuff. So just make sure that the amount of measurement or assessment you do is proportionate with the size of the problem you are trying to solve, it doesn’t have to be statistically significant or have identified every possible option but it does have to be able to answer the questions. Is this problem really a problem and is this the solution that we want? Let me know what you do to try and overcome confirmation bias. What problems has it caused for you? This entry was posted in Cognitive Biases, Psychology and tagged dmaic, Pullan, Summit, vendor, weighted scorecard. Bookmark the permalink. 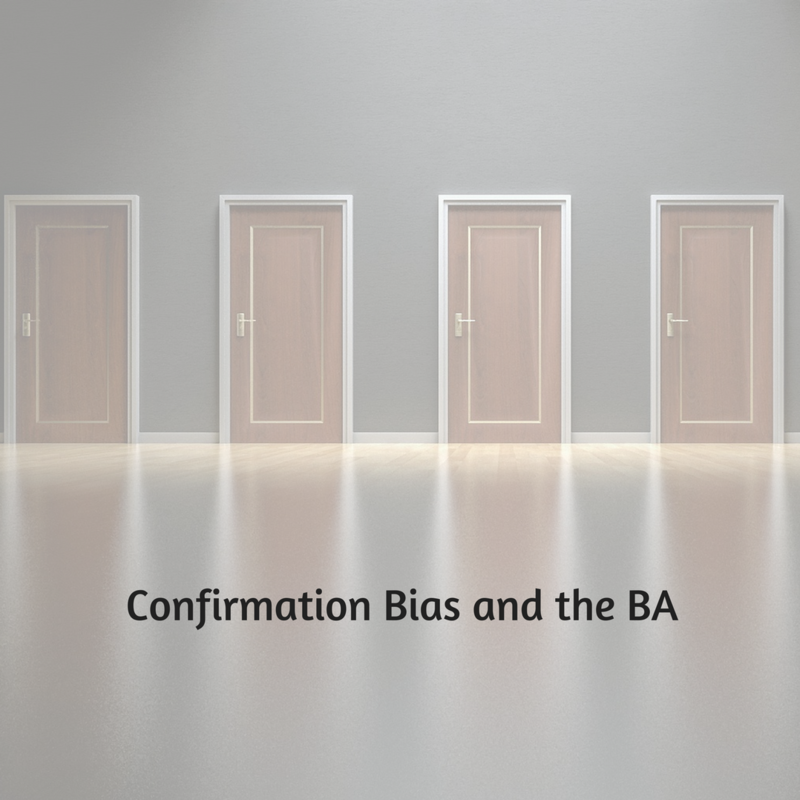 One Response to "Confirmation Bias and the BA"
Thanks, I’ve been seeking for facts about this topic for ages and yours is the best I’ve discovered so far.